NEW YORK (May 16, 2016) – Iraq and Afghanistan Veterans of America (IAVA), the leading post-9/11 veteran empowerment organization, will host and participate in a series of events during Memorial Day weekend (May 28 – 30) to honor our nation’s fallen service members. 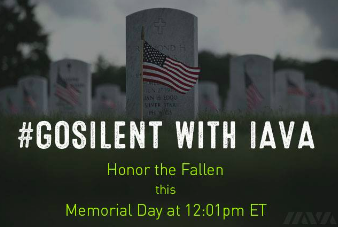 Leading up to Memorial Day, IAVA is promoting its fifth annual #GoSilent campaign, which encourages Americans to pledge a full minute of silence at 12:01 p.m. ET on Memorial Day. The #GoSilent campaign allows for a shared, nationwide experience, in which pledges can be made in honor of a fallen service member. The moment of silence will coincide with events in New York, Washington, D.C. and across the country, including IAVA’s participation in a wreath laying before the Tomb of the Unknown Soldier at Arlington National Cemetery. As part of a weeklong awareness campaign leading up to Memorial Day, IAVA and its 425,000 members will lead community-based Memorial Day events from Hawaii to Florida. On Armed Forces Day, May 21, IAVA and participating Victory Motorcycles dealerships across the country are teaming up to host IAVA’s signature community empowerment events, called VetTogethers. On May 28 in Washington, D.C., riders can join Victory and IAVA on the National Mall to meet Victory rider, film star and retired U.S. Marine R. Lee Ermey – “The Gunny” – for a VetTogether at the IAVA display. In addition, four D.C.-area and one Pennsylvania Victory dealers will host Victory-IAVA Pit Stops for local riders and those arriving for the next day’s Rolling Thunder ride. On May 28 and 29, IAVA and its members will spend the day at the Intrepid Sea, Air and Space Museum in New York City to educate veterans and the public about what it means to #GoSilent. On Memorial Day, May 30, IAVA staff and members will participate in a wreath-laying at Arlington National Cemetery in Washington, D.C. Following the wreath-laying, IAVA will lead members to section 60 of Arlington National Cemetery to pay tribute to the men and women who made the ultimate sacrifice in Iraq and Afghanistan. IAVA will also join President Barack Obama and New York City Mayor Bill de Blasio for Memorial Day breakfasts in Washington, D.C. and New York City, respectively. All Americans are encouraged to take the #GoSilent pledge at iava.org/go-silent.